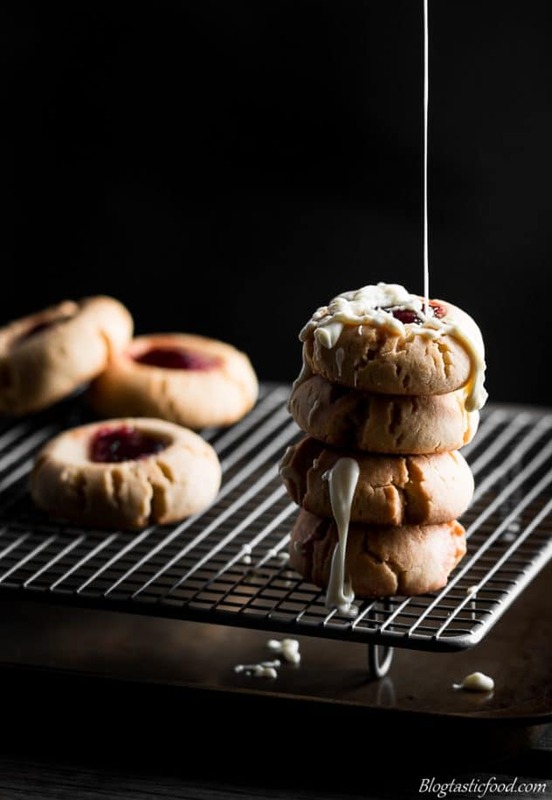 There is nothing better than a peanut butter flavoured cookie with a big dollop of jam on top. Unless you drizzle white chocolate all over that cookie!! These cookies are so easy to make and if you’re gluten-free don’t worry, I’ve got your back!! This isn’t the dessert I would have on special occasions. This is the kind of thing I’d have for chill moments. Like, having a cup of tea in the afternoon after work, or snacking on something while watching a movie. I would say that these cookies are kind of like shortbread biscuits on the outside, but then they have that little bit of softness and chew on the inside. Which I think it’s perfect, so I’m glad I stuck it out when testing this recipe as it took me 5 attempts to get it right. Yes, you read that correctly, out of all the recipes I have done, it took me 5 tries to get COOKIES right…..don’t judge me. Anyway, if you’re gluten-free, fear not. For there is only one very simple alternative you have to make. You change the flour….yep, it’s that simple. Use gluten-free self-raising flour instead of regular self-raising flour and your good to go. Perhaps you may want to look at the ingredients when you buy the peanut butter, just to make sure it doesn’t have any stabilizers that contain gluten or anything of that nature, but I doubt that will the case. The real question is, are they different? And the answer to that is yes, yes indeed. As you can see, the raw dough looks different. The raw gluten-free cookie dough is a little bit lighter in colour, and this is what they look like when they are cooked. 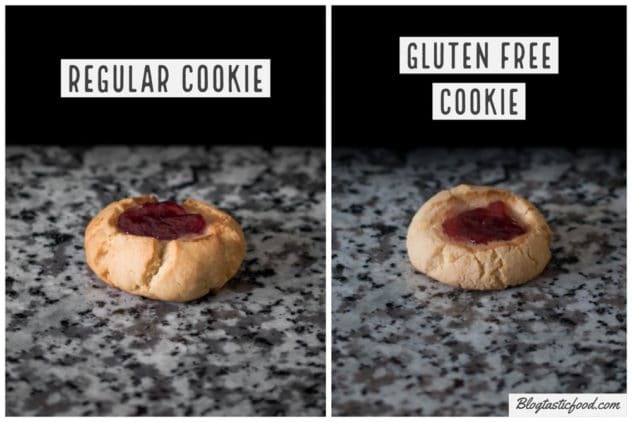 The gluten-free cookie is pretty much the same, it’s just a tad bit lighter in colour if you look at it closely. However, this is not the main dereference. The biggest difference between these 2 cookies is the texture. The gluten-free cookies are a bit more crumbly, they aren’t dry, they’re just a slightly more shortbread-like, some of you may like that, some of you may not. The regular cookies and much denser, and they have the slightest bit of chew to them. If you want your gluten-free cookies to be less crumbly, you can try adding a little less flour, perhaps reduce it by 10-15 grams, but I think both are fantastic and taste awesome. Ok, so if you’ve made cookies before I’m sure you already know this. When cookies come straight out of the oven, they are always soft or they feel way too delicate. The first time I noticed this, I was confused and thought I messed them up. If you experience this don’t worry, this is not the case. You just need to wait for the cookies to cool and they’ll firm up. Wait a few minutes for the cookies to cool a bit on the tray, then transfer the cookies to a cooling rack. In order to make the cookies, you need to make cookie dough. And if you’ve baked a lot before, I am sure you know that it’s a lot more challenging to bake desserts like cookies and cakes on a hot day. 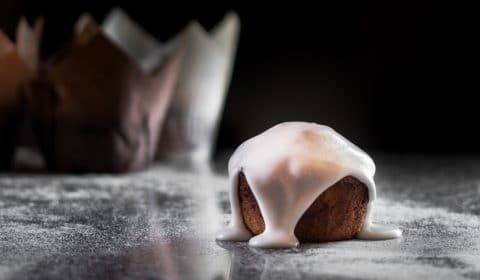 This is because the butter can start to melt inside your batter or dough, and then things can get very greasy and messy. And we want to avoid this whilst we are preparing and rolling out our cookie dough. 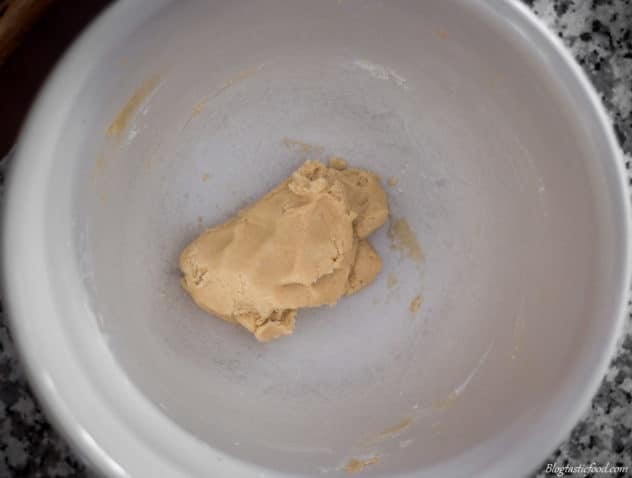 If it’s a hot, humid day, and you feel like the dough may be a bit too soft, and you’re concerned about the butter melting, you can simply put the dough in the fridge for 10-15 minutes to firm it up a bit. From there you should have no problems when rolling out your balls of dough. Now, if you want the just drizzle the cookies using a spoon go right ahead. I do it in this photo and they turned out great! However, if you really care about how the presentation, here is how you take your drizzle game up a notch. So, make sure the cookies are cooled and spaced out nicely on the wire rack before you melt the chocolate because you can’t just keep re-heating chocolate. I always melt chocolate by putting it in a bowl, buzzing it in the microwave for 20 seconds, take it out, mix it, then put it back for another 20 seconds. And I just keep doing that until the chocolate is completely melted. Remember, if chocolate overheats it won’t melt, and you’ll just be left of big dry clumps of…..well, let’s just say it won’t look nice and it will be useless. Get a preferably smaller sized disposable piping bag and open up the top, but do not snip the tip yet. Fill the piping bag with your white chocolate, then, when you snip the tip, snip a very small amount off. Otherwise, it won’t be a chocolate drizzle, it will be a chocolate pour, which will be delicious of course, but just not very presentable. (if any of this confuses you, you can just look at the video in the post). Now you’re set up to drizzle with control baby!! Just drizzle the cookie with an up and down motion. Don’t hesitate too much and don’t go too slow, drizzle with confidence, and have fun with it! 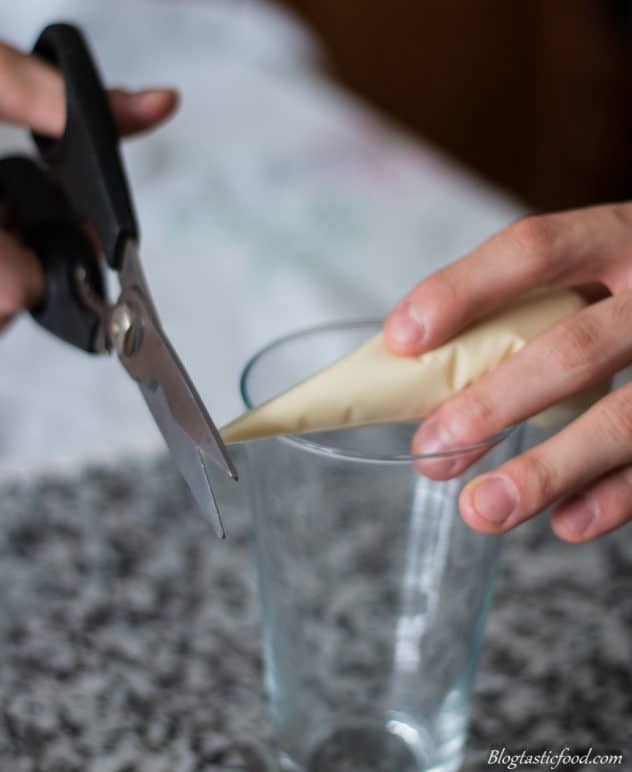 You can apply this technique for cookies, cakes, chocolate strawberries, Panna cotta….any dessert you want!! You can even just use this drizzle technique to garnish a plate to make your dessert look nicer. Thank you so much for reading through my post. If you decide to make these cookies, I really hope you enjoy them!! Subscribe if you haven’t already, I will send recipe posts your way every week. And feel free to leave a star rating in the recipe box below, or leave a comment sharing your thoughts. 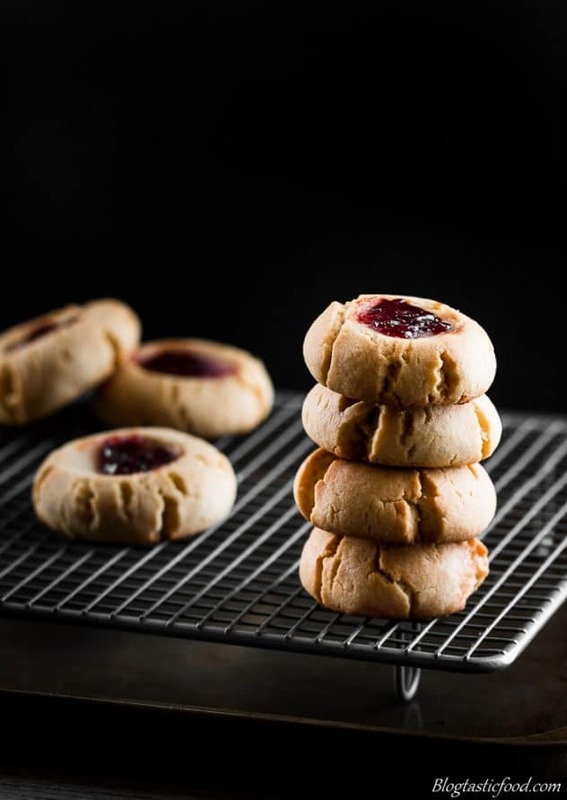 These peanut butter & jam cookies are straight forward, no messing about, classic combo, quick to make......You get the gist. 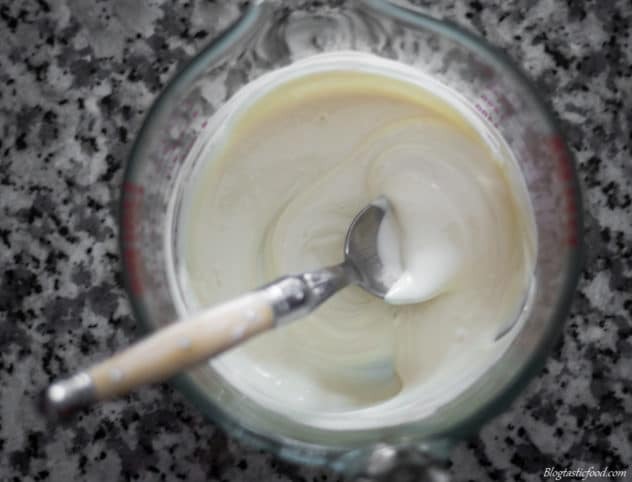 Use an electric beater or whisk to beat the butter, peanut butter and the sugar together until the mixture is light and fluffy. Crack in your egg and then beat through until well combined. 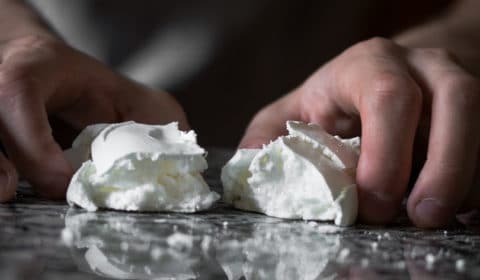 Add your self-raising flour and vanilla extract, then use a wooden spoon or spatula to gently stir the flour through until you have a well combined cookie dough. Line a tray with non-stick baking paper (or a silicone mat if you have one). 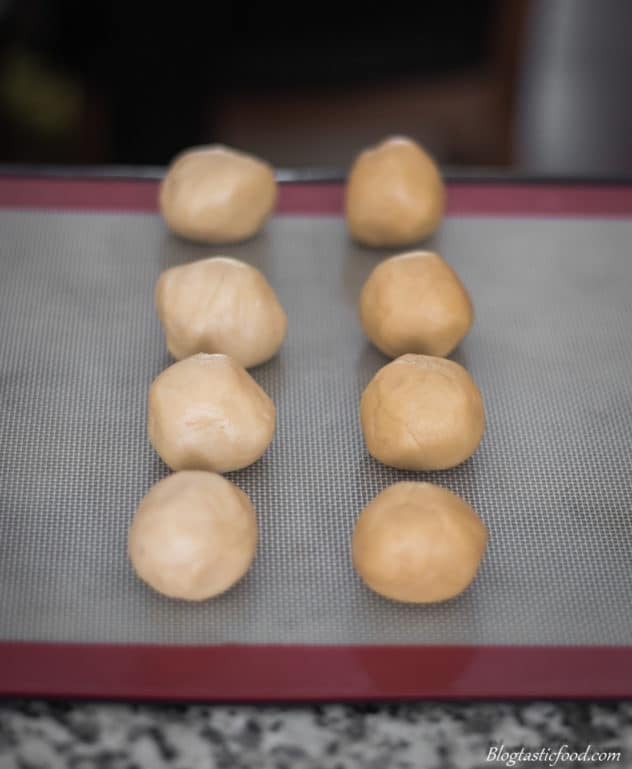 Roll out 8 even sized balls of the dough and place them on the tray. Use your thumb to push a shallow hole in each ball of dough. Then fill each hole up with a teaspoon of raspberry jam. Leave the cookies to cool on a wire rack to firm up. Put your white chocolate in a bowl, then microwave for 20 seconds. Give the chocolate a stir and then microwave for another 20 seconds. Give the chocolate another stir and then repeat one more time to fully melt the chocolate. Drizzle your white chocolate over your cookies and then eat them. 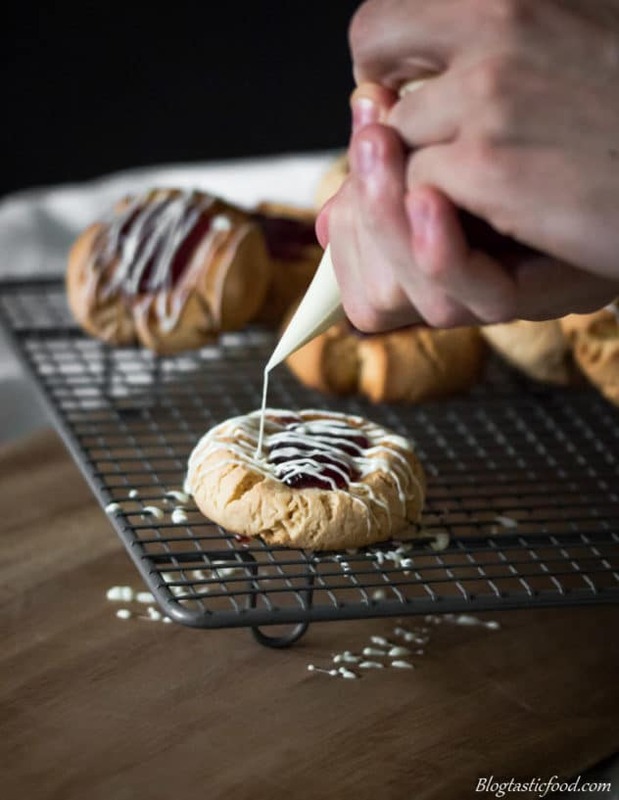 Or, fill a disposable piping bag with the white chocolate, snip the tip of the piping bag, then you can drizzle your cookies in a more controlled and neat fashion. If you want to make these cookies gluten free, just change the regular self-raising flour to gluten-free self-raising flour. When the cookies come out of the oven, let them cool for a minute just to let them firm up. Beware of the temperature of the dough, if it's a humid day, make sure the butter doesn't melt in the dough. Melt the chocolate slowly, NOT at a rapid heat. If you want to make your drizzled chocolate look really nice, use a small disposable piping bag. Fill it up with your chocolate and then snip a tiny bit of the tip off. That way you'll have a more controlled drizzle. 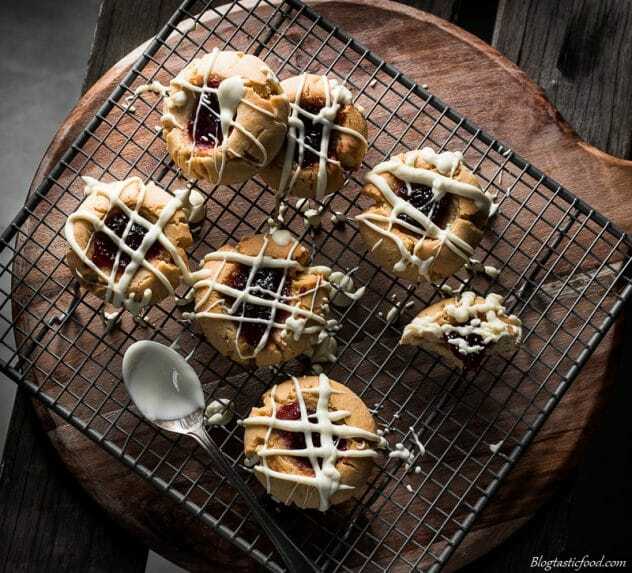 Oh my good gosh – these look so gooood!! 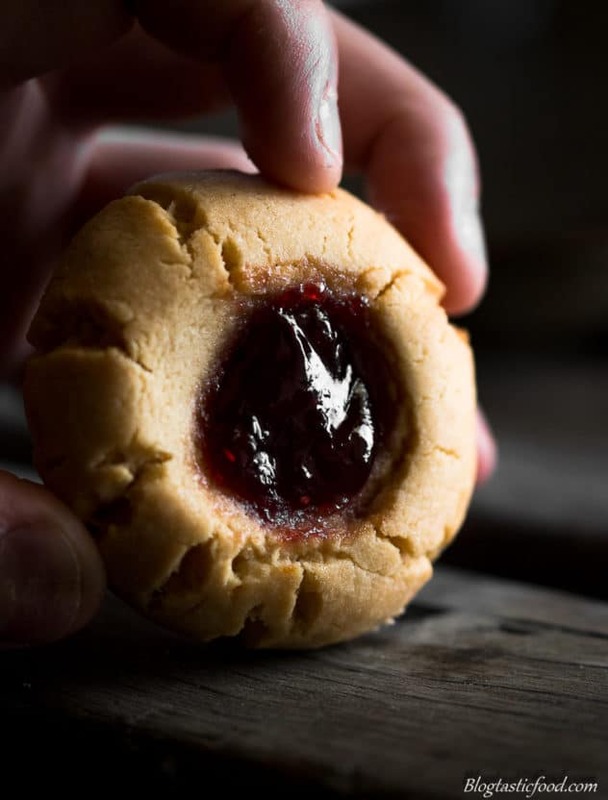 Beautiful thumbprint cookies. I make a version with leftover rugelach pastry (butter and cream cheese) but these look very special with the peanut butter in place of the cream cheese for the tender result. If you’re interested in the recipe I used, check out the link below. Well of all the cookie recipes you could have picked– this one is fantastic!! Thanks for sticking with it to make it perfect!! Pretty and special occasion worthy with that white chocolate drizzle! And the BEST photography as usual! Beautiful post Nick!! I never bake, and these make me want to bake up a batch!!!! Those cookies and the photos look awesome. This looks so yummy! Sometimes we forget to make great old favourites. I should bake some when I make strawberry jam! Thanks for the reminder! I bet the white chocolate takes them over the top delicious! They look amazing! These look absolutely unbelievable. In fact, they make me want to get out of bed and bake up a batch! 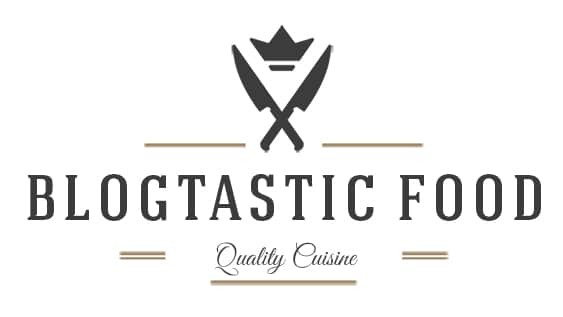 Beautiful post, your food photography is just amazing my friend. Yummy, goooood stuff. Definitely to try. Thanks for dropping by Myspicypasta.wordpress.com and liking my post STEAK SALAD. Love these!!! Just tell me what I can replace the self-raising flour with pleaaaaase? Hmmm, the only thing I can think of is if you mix all purpose flour with some baking powder. The measurements for this are easy to find on google. Thanks for this recipe, will have to try it. These cookies look amazing! Love the drizzle of white chocolate on the top, it definitely makes the cookies even more delicious! Thanks so much! Have an awesome day! Thank you so much brandi! Your blog is incredible btw!! Lovely cookies… don’t know how long the white chocolate would last before it was melted. These look AMAZING !! Great tip about the chocolate drizzle .. you make it look so easy . These cookies look delicious! I love how they can be made gluten free as well! Gorgeous photos too! These cookies look amazing! Thank you for all the tips too like not overheating the chocolate that will make it so much easier to recreate. I love making peanut butter cookies around the holidays and this recipe just gave me something new to try. Great recipe! These look amazing. Your photos are gorgeous! These look so amazing!! I love the idea of the white chocolate on top! Thank you so much Carolyn!!! Have an incredible day!! These look SO good! I’m always looking for new cookies to bring to parties. Thanks for sharing! The drizzle at the end makes those look irresistable! 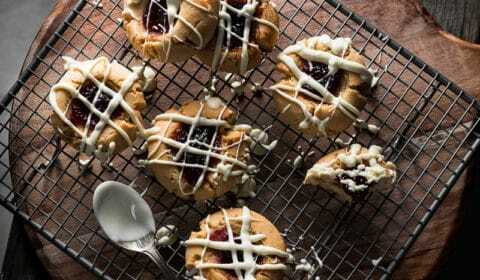 Jam thumbprints are one of my all time favorite cookies, but I’ve never tried them with this twist. I think these my actually be a hit in my house, especially since my husband loves peanut butter. I’m going to try them and see. I LOVE peanut butter and jelly-type desserts. These looks so delicious! Can’t wait to give ’em a try! Thank you so much!! Have an amazing day!! They really are!! Thanks for your visit! I really hope you like them! Thank you so much for sharing! What a great idea! My kids LOVE pb&j!